your talking about the -1 for zombies right? you had me thinking I was wrong, and with my limited time with MOW I thought I was and had to look it up. I think I would go with the +1 plus -1 just like the spawns....the rules state, "bonus modifier" so the bonus would be the -1 when leading, a bonus to the +1 for each crew. so 6 total when defending in a boarding action. so a total of 6. That's just my opinion, I could be wrong. but I'm basing it off of "Bonus", bonus to what? cjbennett22, I can say you are right. you can add the cannon bonus only in first round of boarding and regarding the undead crew point, your crews will be mostly zombies, so the -1 is still there... But the principle is right. If you take the Liche (best Undead wizard costing 300pts!! ), you have 15 crew points per 500 points. So you have 30 crew points in a 1000 point game. Zombie crew is 1poit and -1 in boarding, Skeleton cres is 2 crew points and no bonus in boarding, Wight is 3 crew point and +1 to boarding action. that is 8 ships with 31 crew slots. 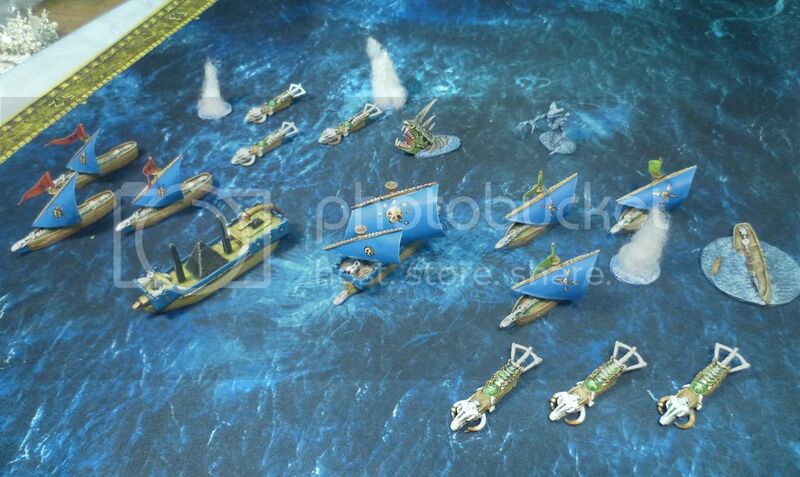 So even vith 300 pts wizard and only 8 ships, you are not able to fully men your ships and all the crew would be zombies with -1 for boarding. I don't have my rules so maybe the ships are more effective than the average in other fleets, maybe the magic is really good? I do really like to just stay back and let magic go for a bit and stack my hand THEN unleash the fleet. I don't see anything unfair with the crew but I can really notice the additional complexity of it, trying to man you ships before taking to the table. This fleet could benefit from a nice spreadsheet to help fill out crew that's for sure. Also, where can I find the rule that states the cannon bonus being only in the first round of a boarding action. it makes sense but is never mentioned in the rulebook that I can find. Thank you. The necromantic specific spells would certainly help with the enemies ships and crew though, ouch! I never looked into the undead, but now, I want to play as an undead fleet or at least against one, they seem fun. Aldhick, I thought you showed me something I had been doing wrong all this time, I was really worried about the grapeshot rule. I never played this game until a couple years ago this coming January and I have tried really hard to learn everything I can but still have yet to play a game against anyone that knows it. 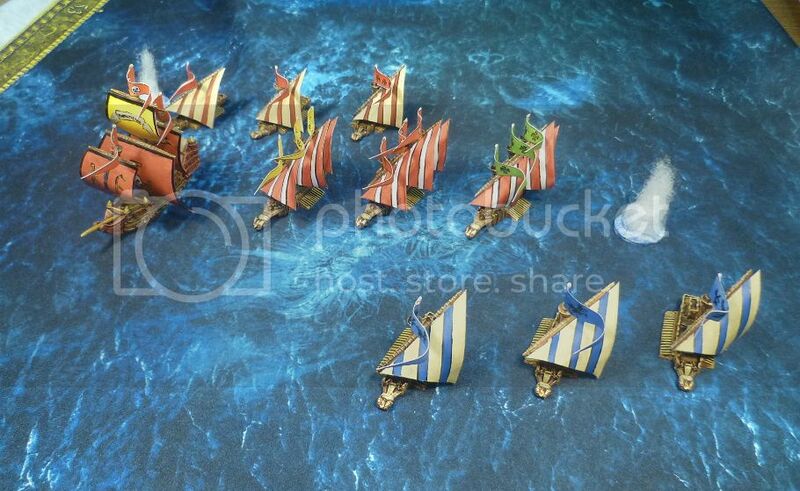 250 points for such uncertanity (in context with the point costs of undead wizards and other ships) it seems like "no way" option to me..
A good rule for the skull rammers, having no oars, would be to treat them just like the high elf dragon ship with the dragon blades. The ships can ram really easily through a ship and in my opinion be worth the 250 for a squadron of three. 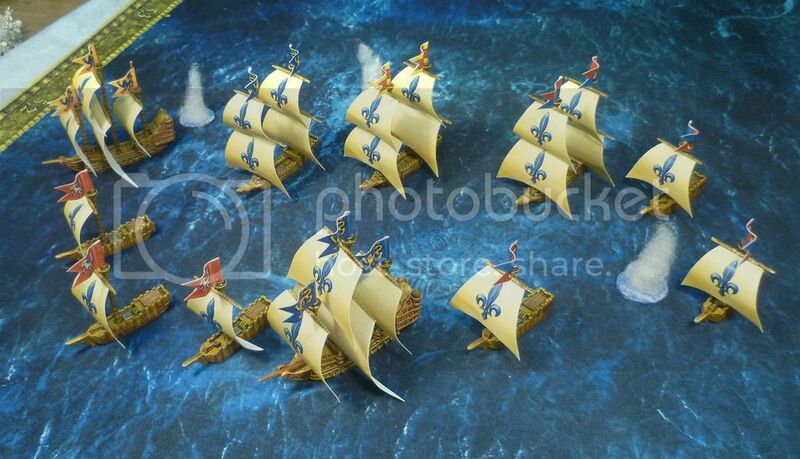 very nice fleets! very nice miss markers too! I hope the undead fleet gets plenty of gameplay and fares well. I wish I was close enough for a game that's for sure.